Our commitment—to customers worldwide—is to produce the highest-quality, manual swim spa cover in existence. Period. The E2E Sport Cover™ is warranted against defects in both materials and workmanship for three (3) years, excluding normal wear and tear. Should you encounter a problem with your E2E order, please contact us immediately; we will work with you to determine the nature of the problem and respond as quickly and fairly as possible. In order to do so, we will require detailed photos of the defect in question. Upon their receipt, we will assess the situation [as best as we are able based on user input] and determine the course of action to be taken. If we find the problem is due to defects in materials or workmanship and falls within the warranty period, we will repair or replace the cover at our option. Due to the chemical makeup of water sanitizers and the oxidation corollary to their functioning—even under normal operating conditions—there are a few occurrences universal to all spa covers. The most common of which is the discoloration of the cover’s vinyl underside due to a combination of both the spa’s heat and water-treatment additives. The same process has been known to alter the texture of the vinyl—giving it a raised, bumpy feel. Due to changes in climate temperature, ambient air, regional environmental factors may or may not have any adverse effects on material, fabric, or thread. Note, however, that despite their undesirability and general unsightliness, neither of these phenomena will detract from the function or efficacy of the E2E Sport Cover. While the side-effects listed above are concomitant to normal wear, it is possible—with improper/excessive use of water sanitizers (Chlorine, Bromine, etc. )—to cause more than just superficial damage to the spa cover. Together with long-term exposure, the overuse of such agents can actually occasion chemical burns on the underside of the cover. And despite the robustness of their wholly-excessive, over-the-top construction, even an E2E Sport Cover is not immune to the virtual conflagration precipitated by the erroneous use of these harsh cleaners. It is thusly the case that we cannot warrant against such damage. In addition to this, we cannot warrant against any resultant damage from sitting, standing, crawling, walking or jumping on the cover. Nor can we warrant against any damage caused by objects placed on the cover, including any crushing, burning, staining, etc. resultant of such. Again—while the End 2 End cover was designed and built to be exceedingly tough, is not immune to abuse, and not designed for such. Lastly, we cannot warrant against damage caused by dragging the cover; surfaces other than the bar-top of the swim spa can and will abrade the cover. In the end, failure to use the cover in the manner for which it was designed can cause damage, and if damaged, the cover may not function properly. We want this to be the best [and last] swim spa cover you ever buy, and its proper care is integral to that end. No charge to the warranty-holder. Warranty-holder shall be responsible for 1/60th of the current manufacturer’s suggested retail price of an End 2 End Swim Spa Cover (of like model) for each full month that has passed since the date of purchase. Prepare the cover for shipment. Ensure the cover is clean and dry. Roll the cover up and wrap with film or foam packaging ready for shipping. Place the cover in a wooden crate or robust shipping box. Ship the cover to the factory. Further, the customer is responsible for all shipping/freight costs analogous to the return. All shipments will be received and inspected. A customer support representative will contact you with an inspection summary. Understand that we cannot accept the shipment if it arrives dirty or wet (both for reasons of health and safety, and because we won’t be able to properly inspect and/or repair the cover in such a state), leaving us without alternative but to ship it back to you. Specifications for the cover’s manufacture are provided by the customer at the time of order; the responsibility for the size, color, and general shape ordered, therefore fall to the same; we assume no responsibility for ill-fitting covers produced as a result of erroneous measurements provided thereby. Returns require a Return Merchandize Authorization (RMA) Form; the customer will be charged a 50% restocking fee for all returns. Further, the customer is responsible for all shipping/freight costs analogous to the return. 6. Alterations or repairs other than those performed or carried-out by End 2 End Swim Spa Covers, or those expressly approved, sanctioned or recognized by the same. If in the end it is determined that your specific problem is not covered under warranty, we will recommend to you the best course of action based on the specifics of your situation. Warranty is non-transferable. The transfer of ownership of the E2E Sport Cover from the original consumer purchaser to another will result in the warranty’s immediate termination, even if prior to the expiration date of its warranty period. E2E, LLC is the sole authority in matters of its warranty, and authorizes no other agent or representative to change, alter, or augment this warranty in any way. Except as expressly provided, there shall be no additional warranty obligation, expressed or implied, oral or statutory; no terms other than those contained herein will be honored or recognized by E2E, LLC. End 2 End Swim Spa Covers shall not be liable for consequential damages, or any expenses incidental to [or resulting from] any breach of the above expressed warranties. 2. This warranty gives you—the customer—specific rights, and you may have other rights which vary from state to state (and from jurisdiction to jurisdiction). 3. Any dispute between the buyer and End 2 End Swim Spa Covers pertaining to this warranty may, at the option of the buyer, be resolved in Nevada according to the rules of the American Arbitration Association. Although the information on this Web site is accessible worldwide, not all products or services discussed in this Web site are available to all persons or in all geographic locations or jurisdictions. End 2 End Swim Spa Covers [and affiliated advertisers] reserve the right to limit the provision of their products or services to any person, geographic area, or jurisdiction they so desire and to limit the quantities of any products or services that they provide. Any offer for any product or service on this website is void where prohibited. In the event of litigation, both parties agree that the State of business registration of End 2 End Swim Spa Covers shall apply, and both parties shall consent to the jurisdiction of said State’s courts, or in the event of diversity of citizenship, the United States District Court for said State’s district. Both parties expressly waive a trial by jury. This limited warranty is valid only after [either] the online warranty registration or the physical warranty mailer have been filled-out completely and submitted to End 2 End Swim Spa Covers within thirty (30) days of your covers’ receipt. 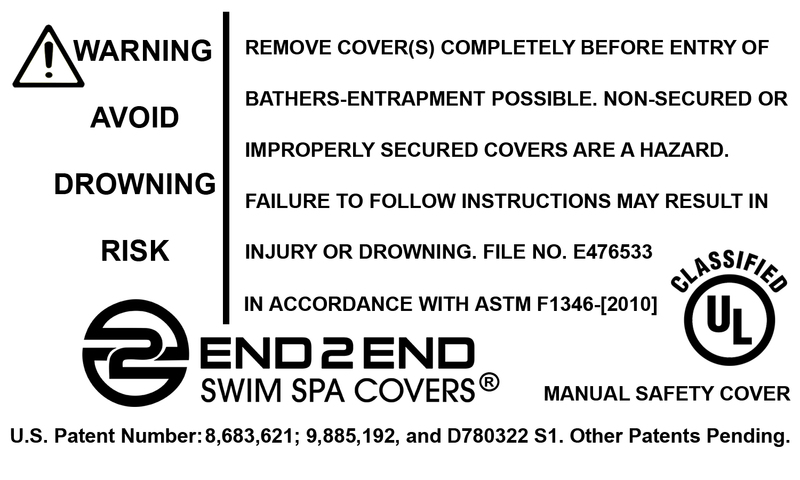 Without a completed registration on file with End 2 End Swim Spa Covers, your E2E Sport Cover is without a warranty. Warranty registration information will be kept on file by E2E, LLC to be utilized in the event a warranty claim is made. Failure to follow all instructions may result in injury or death. Test water temperature before entering swim spa. Keep children away; children or objects cannot be seen under cover. Remove cover completely before entry of bathers; entrapment possible. Remove accumulation with a soft brush or other, non-sharp object. Unsecured or improperly secured covers are considered hazardous. Drowning is possible even on top of the cover; keep spa covered when not in use— empty or full. The Terms and Conditions constitute the entire agreement between you and End 2 End Swim Spa Covers [with respect to this website]. The Terms and Conditions supersede all prior or contemporaneous communications and proposals, whether electronic, oral or written between you and End 2 End Swim Spa Covers. No modification of the Terms and Conditions shall be effective unless it is authorized by End 2 End Swim Spa Covers. If any provision of the Terms and Conditions is found to be contrary to law, then such provision(s) shall be constructed in a manner to closely reflect, as much as possible, the intentions of the parties, with the other provisions remaining in full force and effect. E2E reserves the right to alter this policy in whole, or in part, without prior notice. Refer to the most recent copy of this policy only; other copies will be considered invalid. In no event shall E2E, LLC be liable for any direct, indirect, punitive, incidental, or special consequential damages whatsoever—to property or life—arising out of [or connected with] the use or misuse of its products. Nor are we liable.